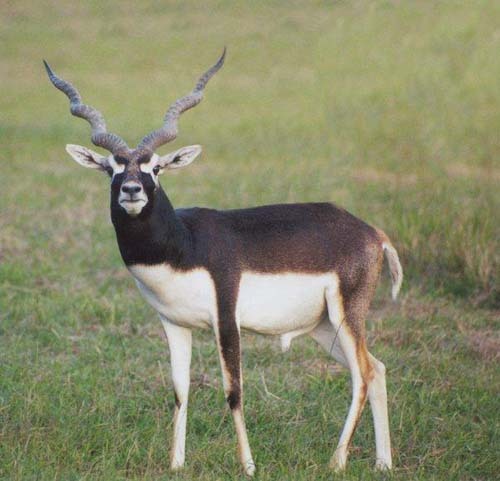 Blackbuck Antelope (Antilope cervicapra)Appearance: Blackbuck are a graceful and handsome antelope with contrasting dark-and-white colouration. Although the females and young are a fawn and white colour, males turn black and white at maturity. Weight: 35-50 kgs (75-110 lbs). Horns: are long, closely ringed and cork-screw shaped, with 3-4 tight twists. Trophy size: Measurement is taken around the curl of the horn. A mature buck has 3-4 twists. Scores vary depending on the tightness of the curl. History: Native to the plains of India and Pakistan they were introduced to several locations in Australia during the early 1900’s. Hunting Blackbuck in Australia: As with many antelope species blackbuck depend on their excellent eye-sight and fleetness-of-foot for defense. They like open country and are a small target making them a challenging trophy.